Seasoned handgun hunters and recreational shooters will agree – hunting without a scope is almost impossible, right? However, picking the one scope that suits your needs the most out of the best revolver scopes on the market isn’t the easiest of tasks. Wading through all the technical jargon can be confusing for novice buyers. Ideally, a good scope should allow you to see your target better and more clearly, while at the same time, it should also be lightweight enough for carrying around. 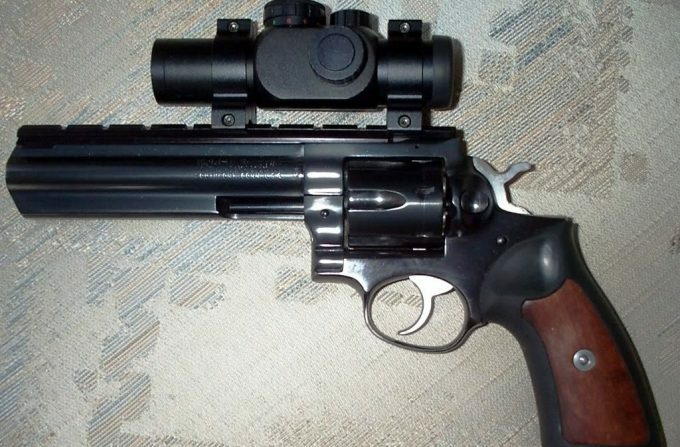 That’s why we’ve decided to go on and do an in-depth article about revolver scopes. Apart from listing the features we believe may matter most when buying a scope, we’ve also included the reviews of the most promising handgun scopes on the market. In case you’re too new to the topic, we decided to do the legwork for you and make a brief introductory guide to buying revolver scopes – only the most important specs and features you should be looking for and why they’re important. Of course, if you’re a seasoned shooter, feel free to skip this section and head straight for the reviews. Either way, we hope you enjoy the read! Eye relief is probably the single most important aspect of a handgun scope, as it affects how you will be aiming your firearm. For those of you not in the know, the eye relief is the distance between the eyepiece lens and the exit pupil. For rifles, we’d be talking three inches on average, but pistol scopes (and Scout Mount systems) are often much longer in order to accommodate for the style of shooting. We’re talking 10 inches at the least, though some go well over 20. For the record, there’s no optimal distance, but the usual rule of thumb is – the more, the better. Exit pupils on scopes (handgun and rifle alike) are, in layman’s terms, those bright discs you see in the center of the field when you look through the eyepiece from about ten inches. The larger the diameter of the exit pupil is, the brighter the image will be. Roughly speaking, you can calculate the size if you take the objective lens’ diameter (in millimeters) and divide it by the magnification. For example, a 4×28 mm scope will have a 7 mm exit pupil (28/4). Of course, if the magnification varies, the exit pupil will vary, but the number we mentioned above (7 mm) is the optimal, as that’s the maximum diameter a human eye will open to. Anything over that will deliver more light than your eye can process. Magnification is important only if you’re keen on making out the details on your target (which is the majority of situations, one would argue). 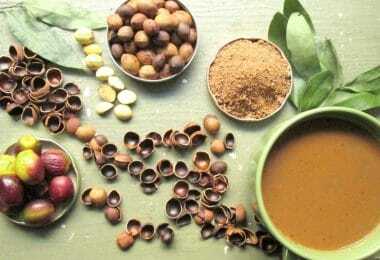 That said, you have a choice between two distinct flavors – fixed or adjustable (variable). Obviously, the latter type is more useful as you can use it in multiple shooting scenarios, but if you only have one application in mind, you don’t really need it. On the flipside, if you need the flexibility, don’t be afraid to splash out some additional money for an adjustable model. Magnification affects more than just the price – ss magnification goes up, the field of view (FOV) goes down. Typically, whenever you’re faced with this choice (especially for hunting), you’ll want to err on the side of magnification (that is, you should favor the FOV). For the uninitiated, the field of view is the amount of vista from left to right you can see through the scope. It’s measured in feet at 100 yards. Let’s paint a picture to make it clearer. Say you’re watching a fence that’s 100 feet from end to end (left to right). With a typical 3x magnification, you’d be able to see about 30 feet, but with a 9x, the number goes down by half (15 feet). Any given scope is only as tough as its mounting system. 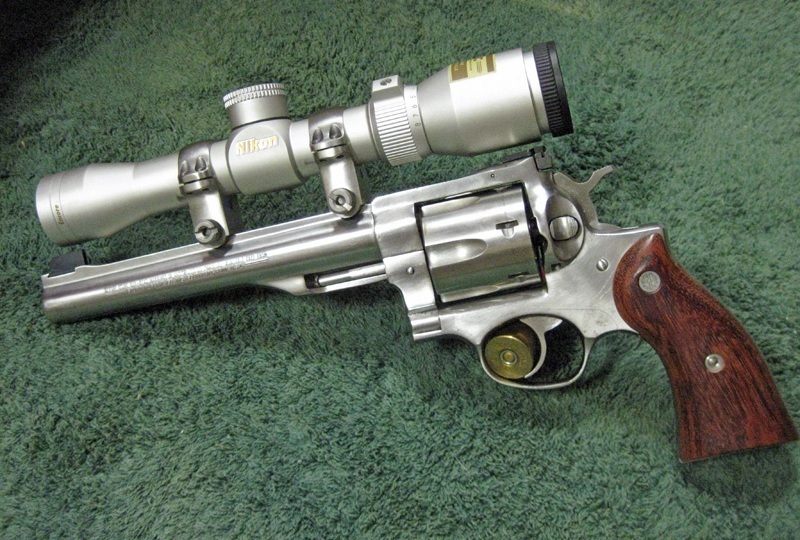 As far as pistol scopes go, you’re looking at Weaver or Picattiny mounting rings. Ideally, you’ll want to go as low as possible in order to facilitate sighting, as well as increase its stability (and longevity, in turn). 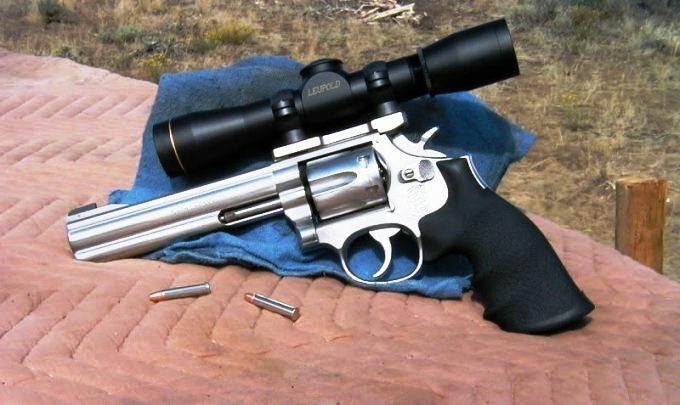 On a similar note, keep in mind that handgun hunters will often use powerful, high-recoil cartridges, which is liable to rattle the scope apart. With that in mind, make sure that the scope you’re getting is rated as shockproof, at the very least. Down below you can read our reviews of the 7 best pistol scopes available at the moment. Of course, when we did the legwork, we made sure to include a little bit of something for everyone and their pocketbook. 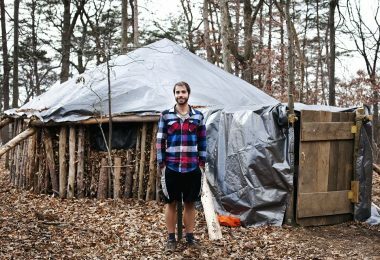 Once again, enjoy the read! We’re kicking off this list with the NcStar 2.5×30 Pistol Scope a nice budget-friendly option for anyone looking for a scope for their handgun. Considering how scope prices go, the NcStar comes off as cheap as dirt. 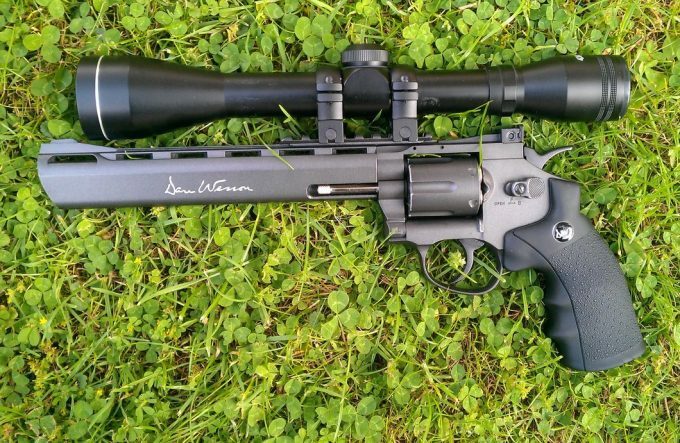 As you may have already inferred from reading the name, the scope comes with a nice 2.5x magnification (not a lot, but perfect for ten yards or so), which is great if you plan on hunting with a big-bore gun, as it allows you to make out the detail on your target and assess it to good effect. On a similar note, the scope does come with a non-illuminated Plex reticle, making for a more natural acquisition, especially if you plan on doing a bit of turkey hunting. It has a long eye relief that is fairly adequate for most applications (10.45 inches), though you will have to angle your arms slightly if you’re tall and/or have long arms. 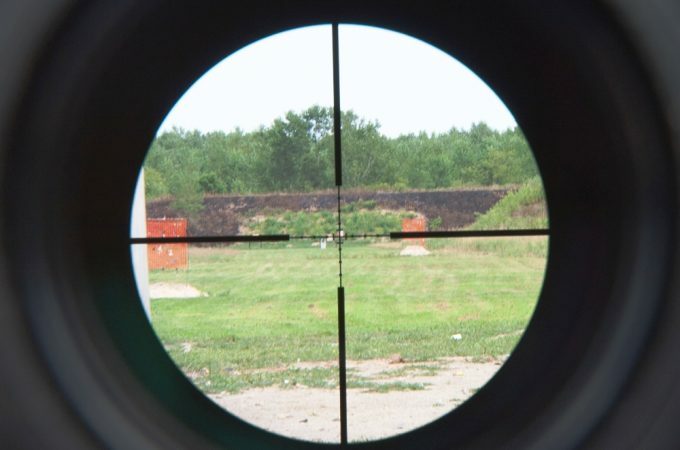 The field of view is decent, but nothing to write home about – 19.5 feet at 100 yards. Related: In case you need versatility in terms of mounting, you might want to check out what NcStar has in the way of scope rings – NcStar 1″ Ring-3/8′ Dovetail-Medium and NcStar 1″ Ring-3/8′ Dovetail-High. Both types of rings should prove to be strong and dependable – you’re supposed to be getting a nice, clean look while not having to compromise on the quality. Leupold is pretty much a household name when it comes to scopes and optics in general, and the Leupold FX-II 4x28mm Handgun goes a long way to maintaining the reputation of the brand. 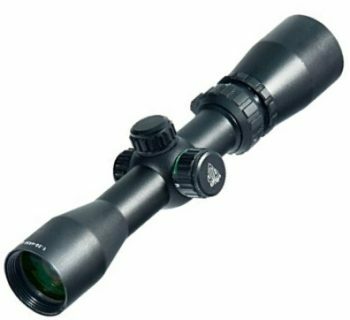 This is a quality scope designed specifically for pistols in mind, well able to handle a lot of recoil and give you plenty of accuracy at around 100 yards and up. It mounts using 1-inch rings (low rings, given it’s a 28 mm scope), and stays put no matter what. On a similar note, the scope is fog proof and waterproof, so you can be sure it’ll survive any amount of punishment you throw its way. The FX-II comes with a generous eye relief (18 inches), though some of you might prefer even longer (if you carry a Remington XP-100 or similar piece). That said, it’s worth noting that Leupold doesn’t manufacture any scope with more than what the FX-II has. While we’re on the subject, it’s important to mention that the scope has a rather underwhelming field of view (9 feet at 100 yards). 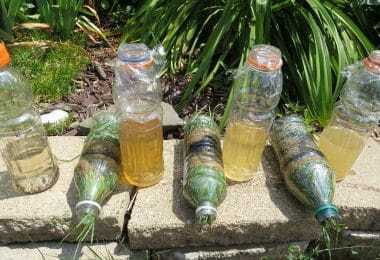 Granted, it’s enough for doing some varmint hunting and plinking at close to mid ranges (up to 300 yards, say). Related: Leupold has lots of accessories for cleaning and maintaining your optics, but you should really start with mounts – the Leupold Rifleman Rings are a nice choice. Once you’ve got that covered, you can check out the Leupold Scope Cover and Leupold Lens Pen for maintenance and mull over buying those as well (unless you already have something similar lying around). 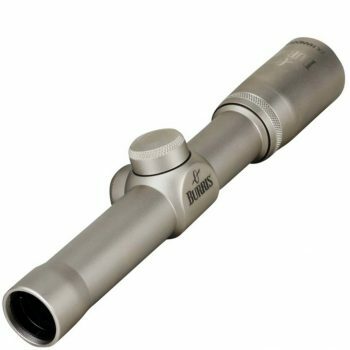 The Burris LER Fixed 2X Handgun Scope comes with a decent 2x magnification that’s perfect for some plinking and potentially pest control (in case you decide to use it on moving targets), but it’s rather underwhelming at long range. The scope comes with an adjustable eye relief. This enables you to shoot from a variety of positions, as well as mount it on pretty much any pistol, even rifle, as long as you have the appropriate mount for it. As far as image quality goes, there’s nothing to fault – the 20 mm lens picks up more than enough light, and the traditional Duplex reticle is easily visible even in low light conditions, allowing you to plink off even at dawn or dusk. 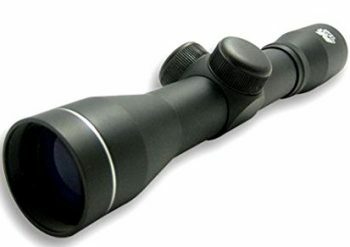 The scope has easily adjustable windage and elevation, with ½ MOA per click and a ±40 MOA range. With 21 feet at 100 yards, the field of view is up to par with the rest of the setup, though you might prefer something even wider for hunting. Now, a couple of caveats are in order. One, you might find the reticle a bit too fine for handgun hunting, and two, the scope really excels if you shoot from bench rest. 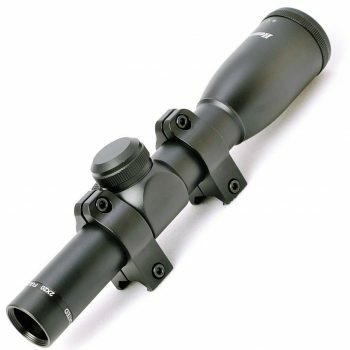 Related: The Burris 420083 Zee Rings seem to be a popular choice for folks getting the scope, although you can just as easily mount it using the 420084 Zee Rings (low and medium, respectively). The former, however, are more in line with the 20 mm objective lens. As the astute readers may have already inferred, the Simmons ProHunter Truplex Reticle Handgun Scope comes with a Truplex reticle, which is just basically the plain old all-purpose Duplex reticle. For some reason, each scope manufacturer has a different name for it. The naming pattern aside, this scope is really a great bang for the buck – the optics are surprisingly good for the price range, and it’s durable enough to withstand recoil from any sort of firearm, from handguns, through rifles, to shotguns. Another great feature about that adds to its versatility is the adjustability. In addition to the standard adjustable windage and elevation range, the scope also features adjustable magnification (2–6x) and a generous adjustable eye relief (3.75–20 inches). 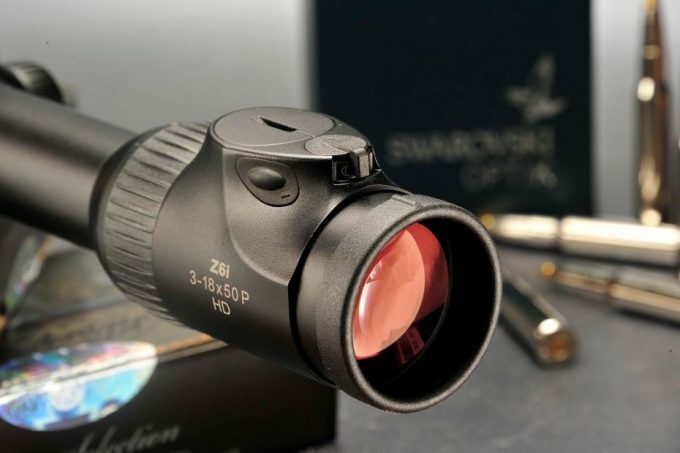 Getting back to the windage and elevation for a brief moment – this scope comes with what Simmons calls TrueZero system, which allows the scope to lock in and hold zero even with heavy recoil. 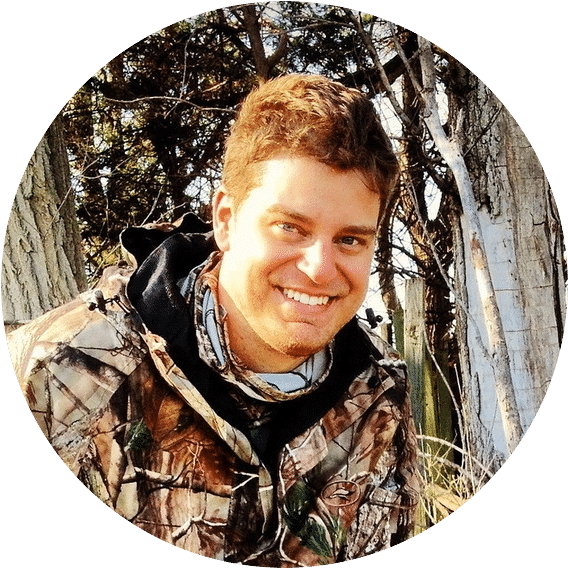 Speaking of which, it’s important to mention that the scope has been extensively tested and certified to handle recoil from a .375 H&H magnum rifle, as well as a 3.5-inch shell fired from a 12-gauge slug gun. Related: The upfront costs of the ProHunter aren’t that big, but if you don’t maintain it well, they can mount surprisingly fast. Consider getting the Carson Stuff-It Microfiber Lens Cloth Cleaner to keep the lenses in good order. 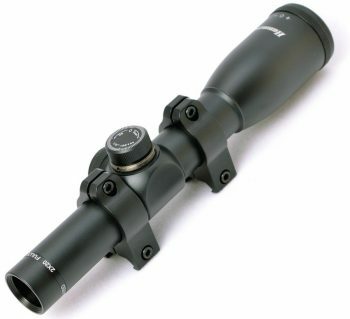 Also, seeing as the scope doesn’t include mount rings, you’ll need a pair. Check out the Weaver Quad Lock 1-Inch High Detachable Rings – these should be a good fit. If you’re in the market for a streamlined, compact handgun scope, be it for hunting or just plinking off in your backyard, then the Hammers 2x20S Elite Compact Pistol Scope might just be the perfect thing for you. The scope is rather cheap, but still, packs a good bang for the buck. The housing is lightweight but durable and resistant to shocks and recoil up to .500 S&W Mag. 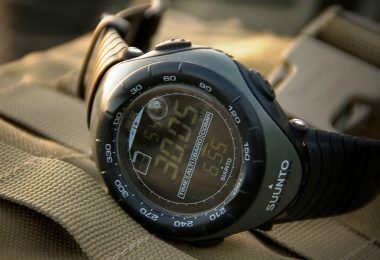 It’s also rated as fogproof and waterproof, so you could take it out hunting in rain. 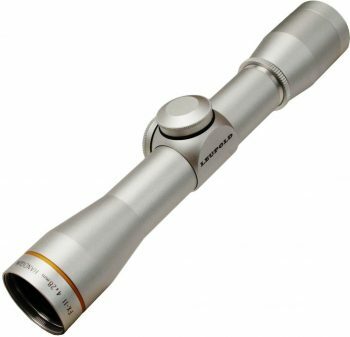 The optics are also surprisingly good for the price range – multi-coated reflective lenses, substantial 40 mm objective lens, plenty of eye relief for most applications (12.50 inches), the works. Granted, both the field of view (15.72 feet at 100 yards) and magnification (fixed, 2x) are a bit underwhelming considering the quality of the housing and optics, but they’re far from unusable, right? Another nice feature is the finger-adjustable windage and elevation system (¼ MOA per click), which lets you fine-tune your scope without reaching for the toolkit. One final point – the scope comes with a decent value package that includes the scope itself, a couple of bungee-corded see-through lens caps, as well as a pair of Weaver-compatible scope rings. Related: Another product you may find interesting is the NcStar CVBAB2939T Battle Belt – it’s something that should allow you to comfortably wear your shooting gear at all times. The belt comes with plenty of pouches and storing departments in which you can store different hunting and outdoor accessories. On top of that, it should prove to be pretty sturdy and durable. As the title might suggest, the UTG 1.25-4x32mm Handgun Pistol Scope is a beast of a handgun scope, at least when it comes to the eye relief. It’s fully adjustable and goes all the way up to 26 inches, making it ideal for shooting with your arms fully outstretched. On that note, the scope is quite lightweight (two ounces shy of a pound), and you can probably manage shooting single-handedly (depending on the weight of your firearm, of course). It comes with the parallax preset at 35 yards and adjustable magnification (from the negligible 1.25x to 4x), really recommending the scope for target shooting. While we’re discussing adjustability, it’s worth noting that the UTG scope features a traditional all-purpose Duplex reticle with adjustable side-wheel illumination (red or green). This is powered by a single Cr1620 3V battery (comes with the purchase). The housing is another major selling point of the UTG scope – it’s certified as rainproof (completely sealed) and fog proof (filled with nitrogen). It’s also shockproof, so it should any punishment the weather can dish out. Related: In case you want to have a spare mount ring or upgrade an existing mounting system, you might want to check out the UTG PRO US Made POI Picatinny Rings. 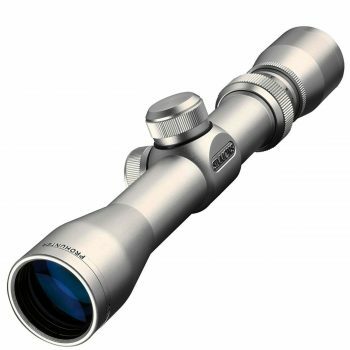 Designed to fit multiple rail platforms – do check specifications first – the rings should allow you to achieve a seamless ring-to-scope interaction, bringing your outdoor hunting experience to a whole different level. The Hammers Elite Compact 2x20mm Handgun Scope is one of the most lightweight scopes available on the market. If you’d prefer not to carry some extra weight on your back during longer trips, then this scope may be ideal for you. The scope is compact and streamlined so that it sits nice and low on your pistol. 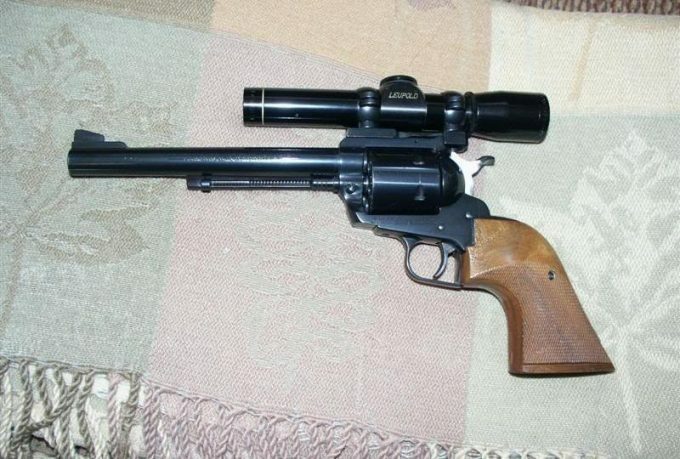 On top of that, it comes with a fairly long eye relief (12.50 inches), which makes it ideal for two-hand shooting with your arms somewhat bent. Another great feature is the finger-adjustable windage and elevation system (¼ MOA per click), multi-coated optics, as well as a nice value package that includes Weaver mount rings (vertically split) and corded see-through lens caps. Now, some novice users might find the single-handed shooting somewhat of a challenge. Another point worth mentioning here could be the diameter lens (32 mm), which some hunter may find to not be enough. However, that was probably done in an attempt to lower the price and make the product even cheaper. All in all, this should prove to be a decent quality product for the average user. Related: If you’re looking for a way to carry your firearms, you could be interested into the UTG Alpha Battle Carrier Sling Pack. It’s a low-profile carrying case that’s padded on the inside, meaning that you should be able to safely transport multiple firearms to your hunting destination. On top of that, the shoulder strap is wide and ergonomic, so you should minimize any discomfort while carrying the case. 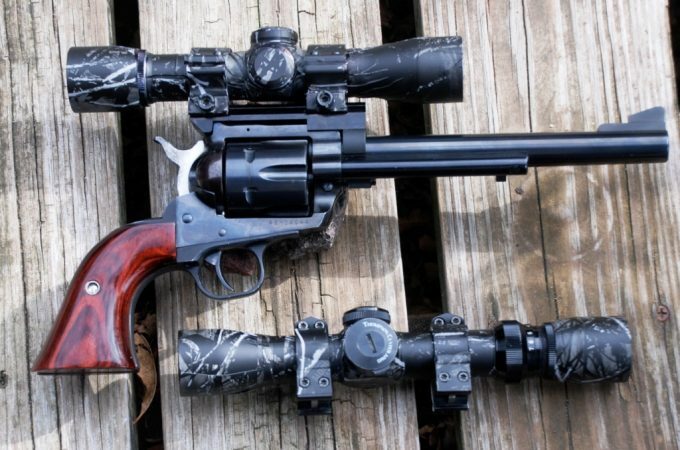 In conclusion, choosing the best revolver scope will depend on many factors, but it’ll pretty much boil down to three things – what you’re mounting it on (size, weight, and recoil), what you’re using it for (optics) and your preferred stance (eye relief). Once you hit the trifecta, you’re golden. Of course, another serious consideration is the budget – if you’re torn between a cheap and a quality scope… well, you never even wanted the cheap one. Save some more money and go for the more expensive one, even if you’re a beginner. Do you agree with our list? Would you like to add something and help out other readers? If so, please, feel free to leave a comment down below and share the article, and it’ll perhaps spark off an educational debate. Happy hunting!